"Beto O'Rourke draws crowds in some conservative enclaves in bid against Ted Cruz" was first published by The Texas Tribune, a nonprofit, nonpartisan media organization that informs Texans — and engages with them — about public policy, politics, government and statewide issues. ROANOKE – There was a frantic energy in the air Saturday morning amid a downpour of chilly rain as cars circled the sprawling John M. Tidwell Middle School parking lot in search of spaces. But the candidate was about to speak, so a number of cars gave up. Crying uncle here, however, didn't mean leaving. Instead, they haphazardly parked in fire lanes and were out of their vehicles practically before the engines stopped running. It's the type of scene that plays out every four years in states such as Iowa and New Hampshire: Curious voters cram into gyms and cafeterias and warehouses to see the latest buzzed-about candidate who's come to town. Except this wasn't an early voting state, and this was not a candidate for president. Instead, hundreds of Texans turned out on Saturday to hear U.S. Rep. Beto O'Rourke, a Democrat from far away El Paso, make his case for the U.S. Senate. This has been happening around the state but O'Rourke assured these Texans that they were special in his path to victory against Republican U.S. Sen. Ted Cruz. "If there is one county that is the linchpin of the 254 [counties] that will determine the outcome of this election, it is Tarrant County," O'Rourke said. While Republicans have fled some of the state's other large urban counties in droves for surrounding suburbs, in Tarrant, many of those conservative voters moved to suburbs within the county, keeping it a GOP stronghold for years. And the strongest Tea Party bastion of all is Tarrant's northeast corner. The county seat is Fort Worth, a large U.S. city in its own right that is often begrudgingly overshadowed by next-door neighbor Dallas. Some Fort Worth neighborhoods have been known to produce highly-organized voter turnout, particularly the liberal east side, which constitutes Democratic U.S. Rep. Marc Veasey's base. But on Saturday, O'Rourke campaigned in the suburbs of Bedford and Roanoke. This area is home to the NE Tarrant Tea Party, one of the most potently effective and organized Tea Party groups in the state. Later in the day, he hosted an event on the southern edge of the county in Burleson, another community where conservatism runs deep. Former state Sen. Wendy Davis, a Democrat, grew up in northeast Tarrant County and suggested moments like O'Rourke's success in the area demonstrates "the long-term fracture in the Republican Party." "We have traditional, business-minded Republicans who support the idea of investing in public education and respecting the ability of everyone to realize their full potential in conflict with Tea Party Republicans who stand for very different ideals," she said. In Roanoke, O'Rourke criticized the recent GOP tax law and advocated for making changes to the campaign finance system and boosting education funding. But he also spoke heavily about gun control and immigration — issues that might cause cringing among down-ballot Democratic candidates who want to focus on job creation. "The fact that we don't even need to mention the name of our opponent — because that's not what it's about," he said. Earlier that morning, O'Rourke campaigned at a Mexican restaurant in a Bedford strip mall. Again, the rain poured, and again, curious Texans spilled out into the patio and stood under awnings. Susan Harper, a local teacher, suggested that is why she braved the rain. Ten or so years ago, she said, Democrats were so scarce in her precinct that she was among 12 to vote in her party's primary on that day. "I found my tribe," she said. Consciously or not, O'Rourke is following then-U.S. Sen. Barack Obama's Iowa strategy in 2007 of campaigning hard in conservative areas with an aim to lose less badly there and make up the difference in urban areas. O'Rourke is rapidly narrowing the gap in fundraising against Cruz – a sign of strength and enthusiasm. But Cruz could draw tens of millions of dollars in support from super PACs, and if control of the closely divided Senate were to boil down to Texas, the amount of money outside GOP groups might spend to hold on to the state could prove record-setting. "I think Ted Cruz is an exceptional candidate and has been an exceptional leader for Texas," he told the Tribune in late January. "He's done all the right things, he'll continue to be a strong voice." Texas hasn't elected a Democrat to statewide office since 1994. Gardner suggested that if Texas could flip, then the entire political map would have been upended. "If people are worried that Texas is in play, then I guess California is our next victim when it comes to Senate races, too." Cruz's own consultant, Chris Wilson, tweeted a link to an El Paso Times article that reported 500 people turned out to Cruz's own event over the weekend in El Paso — O'Rourke's own hometown. Tweaking reporters in Tarrant County, he wrote, "OMG it's a wave!" "In Texas, there's nothing Democrats would like more than to turn Texas blue," Cruz said at that event, the Times reported. "The men and women in this room are on the frontlines of the battleground to make sure that doesn't happen. If we know the hard left is going to show up in big, big numbers, then our job is clear: We got to make sure conservatives show up in big, big numbers to keep Texas red." "The numbers right now don't worry me," she wrote to the Tribune in an email. "Patrick will win handily. But it would be foolish to ignore the momentum. If they can maintain it, they will eventually start making progress." Back at the Mexican restaurant in Bedford, many of the attendees said the O'Rourke event and the recent proliferation of anti-Trump local organizations has made them realize they are not the only Democrats in their neighborhoods. But what if Gardner and the other Republicans are right — that all of this excitement and effort is for naught, that Cruz's re-election bid is safe, as all statewide Republican candidates have been for over 20 years? "I'm awake," said Harper, the Democratic teacher. "I'm not going back to sleep." Beto O'Rourke draws crowds in some conservative enclaves in bid against Ted Cruz By Abby Livingston February 26, 2018 ROANOKE – There was a frantic energy in the air Saturday morning amid a downpour of chilly rain as cars circled the sprawling John M. Tidwell Middle School parking lot in search of spaces. But the candidate was about to speak, so a number of cars gave up. Crying uncle here, however, didn't mean leaving. Instead, they haphazardly parked in fire lanes and were out of their vehicles practically before the engines stopped running. It's the type of scene that plays out every four years in states such as Iowa and New Hampshire: Curious voters cram into gyms and cafeterias and warehouses to see the latest buzzed-about candidate who's come to town. Except this wasn't an early voting state, and this was not a candidate for president. 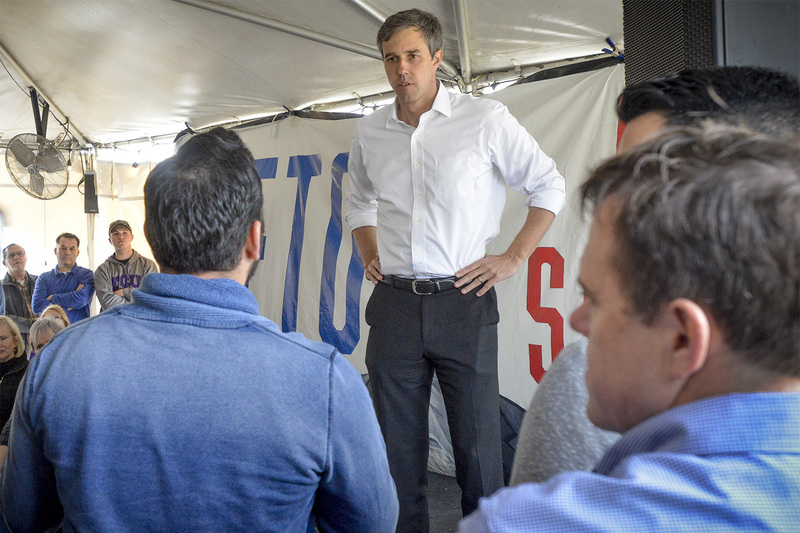 Instead, hundreds of Texans turned out on Saturday to hear U.S. Rep. Beto O'Rourke, a Democrat from far away El Paso, make his case for the U.S. Senate. This has been happening around the state but O'Rourke assured these Texans that they were special in his path to victory against Republican U.S. Sen. Ted Cruz. "If there is one county that is the linchpin of the 254 [counties] that will determine the outcome of this election, it is Tarrant County," O'Rourke said. So why Tarrant County, of all places? This section of the sprawling, multi-county Dallas-Fort Worth metropolitan region is the largest county in Texas that voted for Donald Trump in 2016. While Republicans have fled some of the state's other large urban counties in droves for surrounding suburbs, in Tarrant, many of those conservative voters moved to suburbs within the county, keeping it a GOP stronghold for years. And the strongest Tea Party bastion of all is Tarrant's northeast corner. The county seat is Fort Worth, a large U.S. city in its own right that is often begrudgingly overshadowed by next-door neighbor Dallas. Some Fort Worth neighborhoods have been known to produce highly-organized voter turnout, particularly the liberal east side, which constitutes Democratic U.S. Rep. Marc Veasey's base. But on Saturday, O'Rourke campaigned in the suburbs of Bedford and Roanoke. This area is home to the NE Tarrant Tea Party, one of the most potently effective and organized Tea Party groups in the state. Later in the day, he hosted an event on the southern edge of the county in Burleson, another community where conservatism runs deep. U.S. Rep. Beto O'Rourke, D-El Paso, a Democratic candidate for U.S. Senator, answers questions at a rally and town hall meeting at the Old Texas Brewing Company in Burleson on Saturday, Feb. 24, 2018. Robert Hart for The Texas Tribune Former state Sen. Wendy Davis, a Democrat, grew up in northeast Tarrant County and suggested moments like O'Rourke's success in the area demonstrates "the long-term fracture in the Republican Party." "We have traditional, business-minded Republicans who support the idea of investing in public education and respecting the ability of everyone to realize their full potential in conflict with Tea Party Republicans who stand for very different ideals," she said. In Roanoke, O'Rourke criticized the recent GOP tax law and advocated for making changes to the campaign finance system and boosting education funding. But he also spoke heavily about gun control and immigration — issues that might cause cringing among down-ballot Democratic candidates who want to focus on job creation. He only passingly mentioned Cruz.&nbsp; "The fact that we don't even need to mention the name of our opponent — because that's not what it's about," he said. Earlier that morning, O'Rourke campaigned at a Mexican restaurant in a Bedford strip mall. Again, the rain poured, and again, curious Texans spilled out into the patio and stood under awnings. Susan Harper, a local teacher, suggested that is why she braved the rain. Ten or so years ago, she said, Democrats were so scarce in her precinct that she was among 12 to vote in her party's primary on that day. Now, she said, she knows there are likeminded people in her conservative community. "I found my tribe," she said. Obama's strategy Consciously or not, O'Rourke is following then-U.S. Sen. Barack Obama's Iowa strategy in 2007 of campaigning hard in conservative areas with an aim to lose less badly there and make up the difference in urban areas. There is scant reliable, public polling on this race, so the best indicators of where it stands are anecdotal evidence like crowd sizes. If a candidate drew these kinds of crowds in smaller states, alarm bells would ring. But Texas is massive in population and in geography, and it is an open question whether this strategy will work. O'Rourke is rapidly narrowing the gap in fundraising against Cruz – a sign of strength and enthusiasm. But Cruz could draw tens of millions of dollars in support from super PACs, and if control of the closely divided Senate were to boil down to Texas, the amount of money outside GOP groups might spend to hold on to the state could prove record-setting. At the same time, Senate Democrats must defend 10 incumbents in states that Trump won, as well as in Minnesota, which he nearly carried. The national parties typically protect incumbents ahead of fueling challengers, suggesting Democrats will spend on protecting seats in Nevada and Arizona before they take a bite out of the many expensive media markets in Texas. U.S. Sen. Cory Gardner of Colorado, who oversees the Senate GOP campaign arm, brushed off any concerns about Texas in jeopardy. "I think Ted Cruz is an exceptional candidate and has been an exceptional leader for Texas," he told the Tribune in late January. "He's done all the right things, he'll continue to be a strong voice." Texas hasn't elected a Democrat to statewide office since 1994. Gardner suggested that if Texas could flip, then the entire political map would have been upended. "If people are worried that Texas is in play, then I guess California is our next victim when it comes to Senate races, too." Cruz's own consultant, Chris Wilson, tweeted a link to an El Paso Times article that reported 500 people turned out to Cruz's own event over the weekend in El Paso — O'Rourke's own hometown. Tweaking reporters in Tarrant County, he wrote, "OMG it's a wave!" But other Republicans are more outwardly cautious — including Cruz. "In Texas, there's nothing Democrats would like more than to turn Texas blue," Cruz said at that event, the Times reported. "The men and women in this room are on the frontlines of the battleground to make sure that doesn't happen. If we know the hard left is going to show up in big, big numbers, then our job is clear: We got to make sure conservatives show up in big, big numbers to keep Texas red." Julie McCarty, president of the NE Tarrant Tea Party, said she expects Republican Lt. Gov. Dan Patrick in particular to bring long coattails to her area. But she is not rolling her eyes at the possibility of a future Democratic surge.&nbsp; "The numbers right now don't worry me," she wrote to the Tribune in an email. "Patrick will win handily. But it would be foolish to ignore the momentum. If they can maintain it, they will eventually start making progress." Back at the Mexican restaurant in Bedford, many of the attendees said the O'Rourke event and the recent proliferation of anti-Trump local organizations has made them realize they are not the only Democrats in their neighborhoods. But what if Gardner and the other Republicans are right — that all of this excitement and effort is for naught, that Cruz's re-election bid is safe, as all statewide Republican candidates have been for over 20 years? &nbsp; "I'm awake," said Harper, the Democratic teacher. "I'm not going back to sleep." Read related Tribune coverage Can Texas Republicans hold America’s reddest large urban county? Ted Cruz goes all in for 2 former staffers in crowded races for U.S. House seats We asked 40 Texas Republican candidates about Trump. They like him. The tweets? Not so much. "Beto O'Rourke draws crowds in some conservative enclaves in bid against Ted Cruz" was first published at by The Texas Tribune, a nonprofit, nonpartisan media organization that informs Texans — and engages with them — about public policy, politics, government and statewide issues. Link back to the original article, which is located at https://www.texastribune.org/2018/02/26/beto-orourke-draws-crowds-conservative-enclaves-bid-against-ted-cruz/.